From 2000 to 2006 the Advancement Office and ISTP had the great fortune of having Mindy W. as a parent at ISTP. Why were we so fortunate? 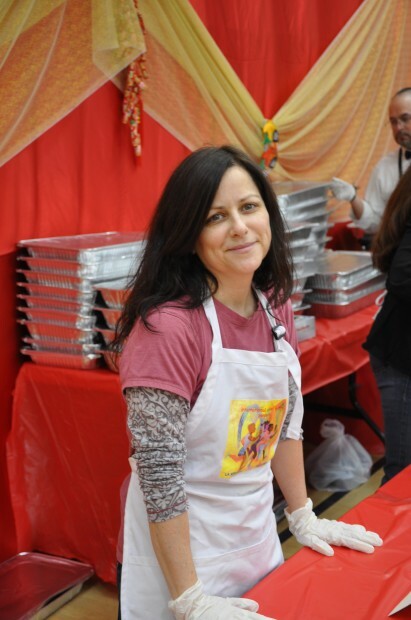 Because Mindy was a volunteer like no other. We so often speak of ISTP and the “strong sense of community”, but our community was not always this strong. Mindy played a large part in turning that around. Through her efforts as the founder and chair (for three years) of the Party Book, Mindy helped bring “community” to ISTP. After chairing the 2003 Gala, “Spirit of the West”, Mindy was a presence at every Gala thereafter. From making gift baskets to donating items, she was ever present and helpful with a smile and a kind word. In the Fall of 2003, as the newly appointed Director of Development I was in need of help. I knew my success hinged upon my volunteers and their capacity and desire to support me. None were more supportive or present than Mindy. The times she went out of her way to help me make things happen at this school are innumerable, and without her I would have been lost. I distinctly remember one “above and beyond” moment that occurred during Mindy’s last year at school. I was practically begging for help from everyone around me because I had nothing to wear that was in the spirit of our 2006 Gala, “Viva La Vida Loca.” I was at the end of my rope when I mentioned my dilemma to Mindy, and she calmly said “No problem. I’ll take care of it.” A few days later, she shows up with a beautiful, brightly colored shawl with the 2006 Gala logo emblazoned on the ends. It was perfect. In the spring of 2006 when we heard Mindy would be moving away from California and our tightly knit community, I knew something had to be done to honor everything she had given to this school. 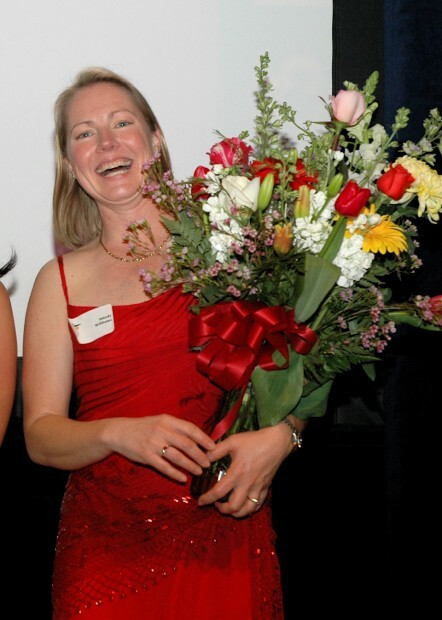 The desire to build a community and the commitment (and desire) to give back in whatever form you can – that was Mindy W. The Mindy W. Lifetime Volunteer Achievement Award was created in honor of this “super-volunteer” Alumni Parent, to recognize and thank other ISTP volunteers who have given of themselves above and beyond the norm. Each year, one (or two) volunteers are recognized for their selfless dedication and commitment to making ISTP a better place for our students and community. The recipients for the 2011-2012 year are Rebecca G. and Debbie C.
Rebecca’s support doesn’t end there. Whenever the Arts Night team needs help prepping artwork, Rebecca is just a phone call away. What do we do when we need more emphasis on a message to the parents regarding Advancement Office needs? We contact Rebecca and the message immediately goes out through the Room Parent network. 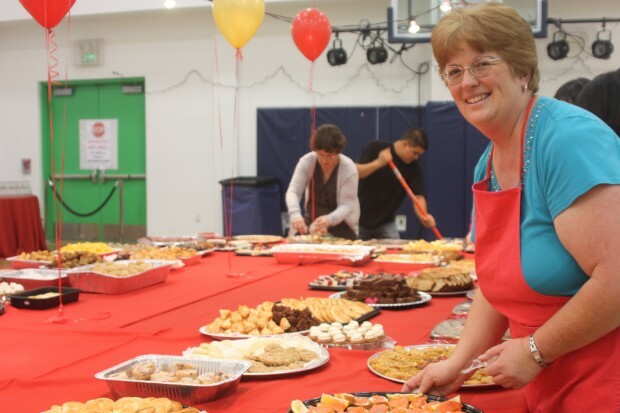 In addition to supporting our office, Rebecca is the Room Parent Coordinator for the Cohn Campus, volunteers for the Chinese New Year float and performance, is a presence on a great number of field trips, and takes the lead on the Chinese New Year hot lunch. Those stunning multi-colored lanterns that adorn the Cohn hallway during Chinese New Year are a gift from Rebecca who makes sure they are hung with care and precision each year. She is a presence with a calm demeanor, which makes her truly wonderful to work with. Arts Night postcards, Gala postcards, Gala invitations, Soirée du Vin invitations – the number of pieces of mail this office churns out is easily in the thousands. And a great number of those cards and invitations has passed through the hands of Debbie C. Whenever a call is made to our volunteers about our need for office help, Debbie is almost always one of the first people to reply. She shows up with a smile on her face ready to whittle through the stacks of labels, postage, and cards that await her. Yet, the buck doesn’t stop there. On Arts Night, many of you enjoyed glass after glass of crémant. Did you know we are charged for each glass that goes missing? For the past two years Debbie has made it her personal mission to make sure each of those glasses is accounted for, and we haven’t had to pay for one missing glass since. Last minute phone calls to pick-up gala auction items or help with the Pâte sell at Geng Road are often made to Debbie because we know she’ll find a way to help. Even if it is only for 20 minutes, she’ll be there. Did we mention she’s been a room parent for the past 4 years? As the nanny for Stephane N., Debbie can fill her days with whatever activities she chooses. Yet, she chooses to make time to support our office and ISTP. ISTP and I are truly indebted to the following past recipients of the Mindy W. Award. 2010-2011 – Veronique M. & Vince F.